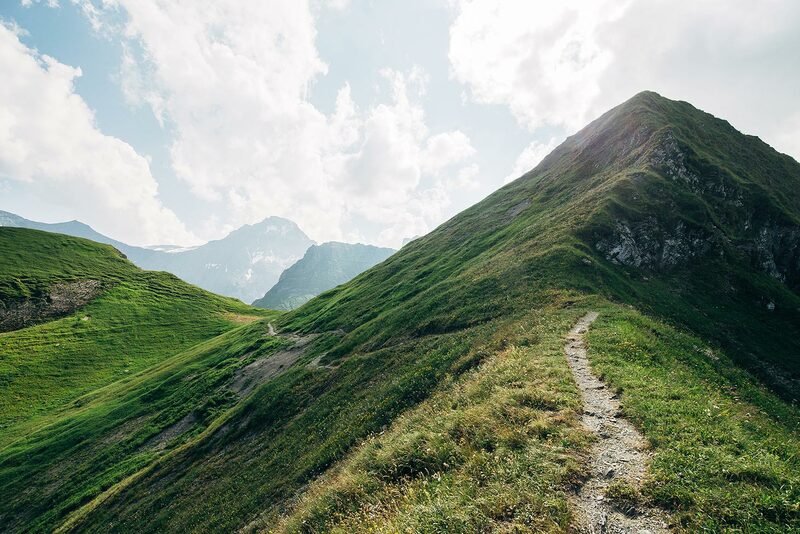 The Swiss Alpine Pass Route is a long-distance hiking trail that spans the width of Switzerland. Last summer, I hiked almost the entirety of it. 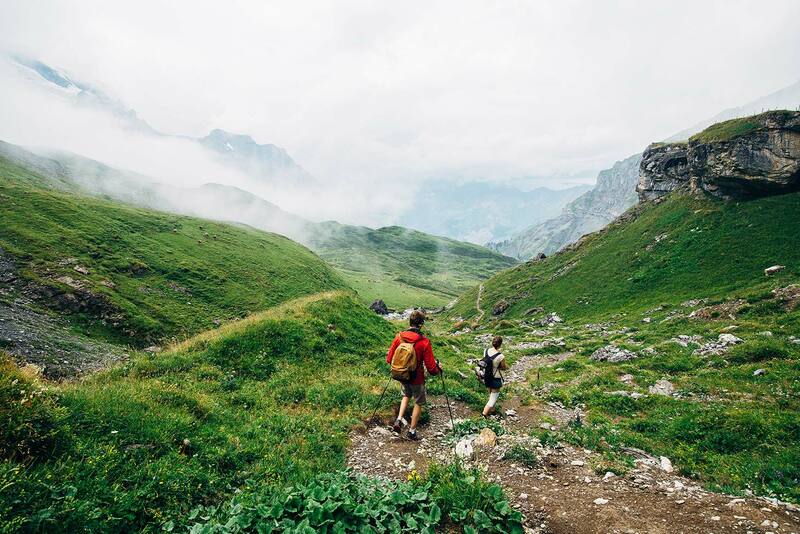 The Swiss Alpine Pass Route (APR) is a long-distance hiking trail that spans the width of Switzerland from Sargans in the east to Montreux in the west along the crest of the Alps. In total, the trail is 230 miles in length, climbing over a total of 60,000 ft of elevation. I set out last summer to conquer the APR in its entirety, a tremendous challenge for me given that my experience as a hiker and outdoorsman had consisted then of a few overnight hikes in New Zealand and some day hikes across America on my 2014 road trip. Nevertheless, I’d grown to love hiking and camping, and I knew that this was going to be the experience of a lifetime. 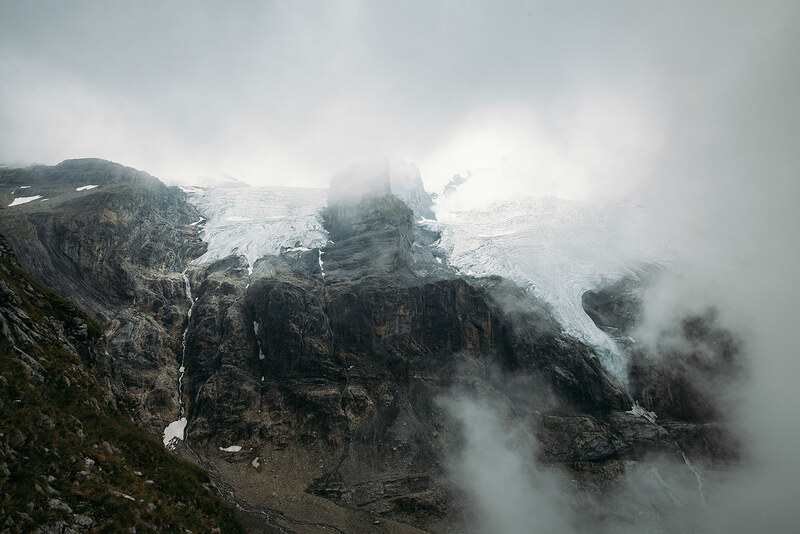 Armed with my photography gear and Osprey pack – a 35-pound monstrosity that held everything from my tent and sleeping bag to completely unnecessary pots and pans – I set out on a balmy Monday morning from Sargans. 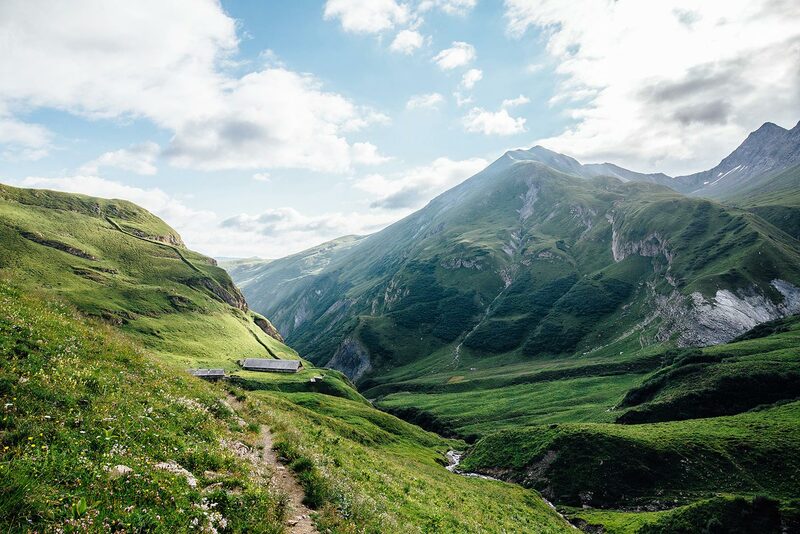 The trail rose steadily from Sargans up the Weisstannental Valley, passing by small pastures and farm buildings nestled on the sides of the mountains. By midday, the refreshing morning mist had given way to a sweltering inferno, the mercury hitting nearly 90°F even high up above sea level in the Alps. I’d been offered lifts from a couple of strangers passing by the road at this point, but declined out of what I can only describe as a reluctant sense of determination to see this journey through on foot. 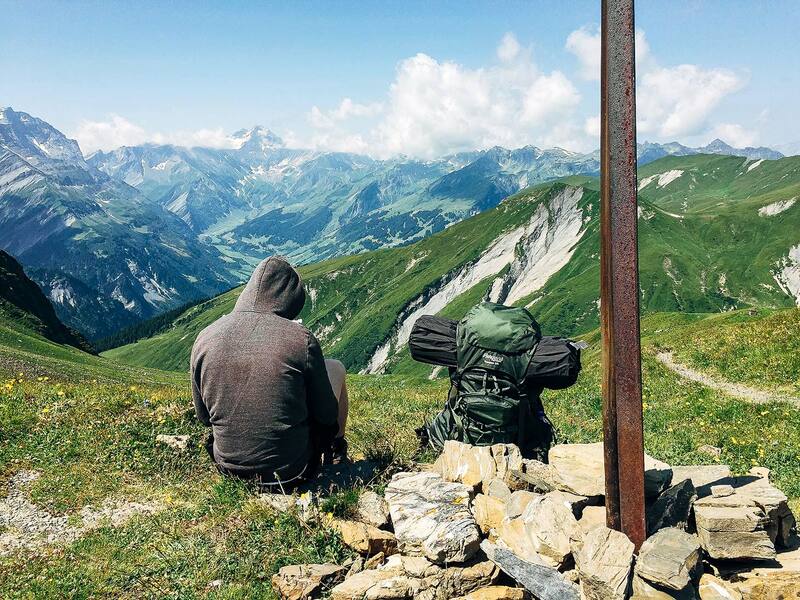 I met up with my hiking partner Neel in Weisstannen, where we took a quick break before diving right back in. We’d had the fairly ambitious plan of hiking up to the first high pass on the APR – Foo Pass at 7,293 ft – that night and camping below it. It was mid-afternoon when we once again set off. The trail conversation started off amicably enough, but after a few hours it had devolved to mutual commiseration in the heat. By sunset, the only sounds filling the near windless valley were our pained grunts as we schlepped up switchback after switchback, confident after each crest that we had finally reached the top. 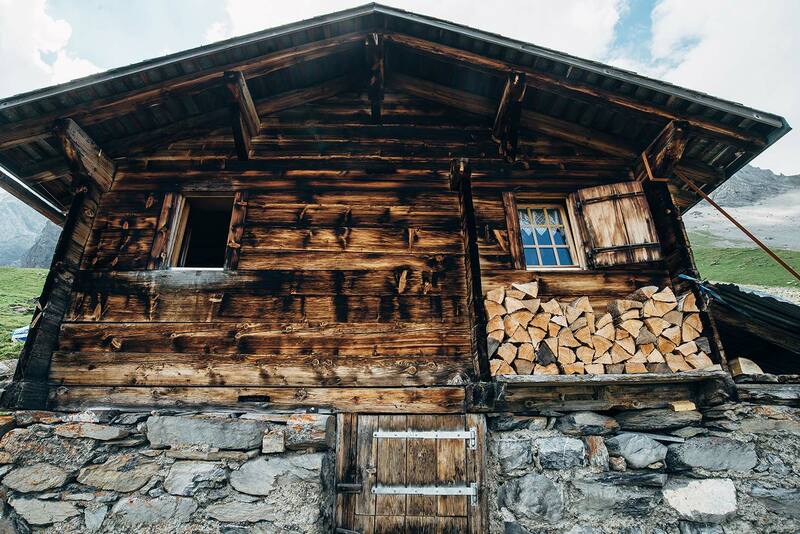 Finally, we reached a large clearing that contained two wooden buildings – a high alpine farm. By unspoken agreement, we’d decided that we were stopping here. No questions asked. We inquired with the farmer if we could pitch our tents nearby, to which he graciously agreed and also offered us the use of his drinking fountain. Relief at last. I was definitely more out of shape than I’d have liked to admit, but even with my entire body aching, there was something awe-inspiring about being virtually alone in the mountains. The low din of cowbells from the pasture, the light breeze wafting over my tent, and the delicious smell of dinner from the farmer’s house – it felt like home. A place I had never been to, but to which I knew I belonged. We fell asleep that night sipping a couple of beers that Neel thought to bring with him to celebrate our first day on the trail. In the morning, the sun danced across the meadow, filtering through between patches of clouds and the spires of the mountains. I snuck away before breakfast to catch some photos of the sunrise, but I doubted there was a photographer in the world who could do justice to the scene before me. We ate that morning in the company of some cows, who were separated from us by an electric fence to prevent them from wandering off the pasture. The sun was already beating down on us, so we hurriedly packed and made our way over Foo Pass. The views from the pass were spectacular. It felt as if we were but drops of water amid a sea of mountains. Reluctantly, we descended down to the town of Elm, where we ended up camping that night. Our plan had been to ascend up to Richetli Pass, the second high pass on the APR, that same day, but it was evident the heat and the weight of our packs wouldn’t stand for it. The next day had a long hike up to Richetli Pass in store for us. By now, we had rearranged our schedule against our ridiculous original intentions, so our plan was to camp at the pass. Still though, the heat wave reached its peak on this day, one of the hottest in Central Europe on record. We opted to take a bus ride up to the Obererbs Skihütte, a decision that had weighed heavily on my mind the night before. On the one hand, the completionist in me had cried out against taking such a shortcut – “cheating,” if you will – but on the other hand, the hedonist in me had said that it was the experience that mattered most in the end. As long as I was having a good time – seeing and photographing beautiful sights, meeting amazing people – then what did a 10-minute bus ride matter? As it turned out, taking the bus was probably the smartest thing we could have done. At the Skihütte, we began our day’s hike, but even at 5,500 ft, the heat was unbearable and we stopped in the shade to wait out the worst of it. The view as we approached the valley under Richetli Pass was stunning and also hid the real treasure that lay beyond. Richetli Pass at 7,418 ft was the high point on this segment of the APR, but there was a second, slighter smaller unnamed pass just in front of Richetli. Between the two was the most gorgeous alpine valley. We decided to camp in the valley that night, but I knew then and there, as we stood above it admiring the view, that I would have to climb back up to watch the sunset. We asked the permission of the farmers in the valley if we could camp on their land, and they agreed we should do it beyond the pastures by the river. 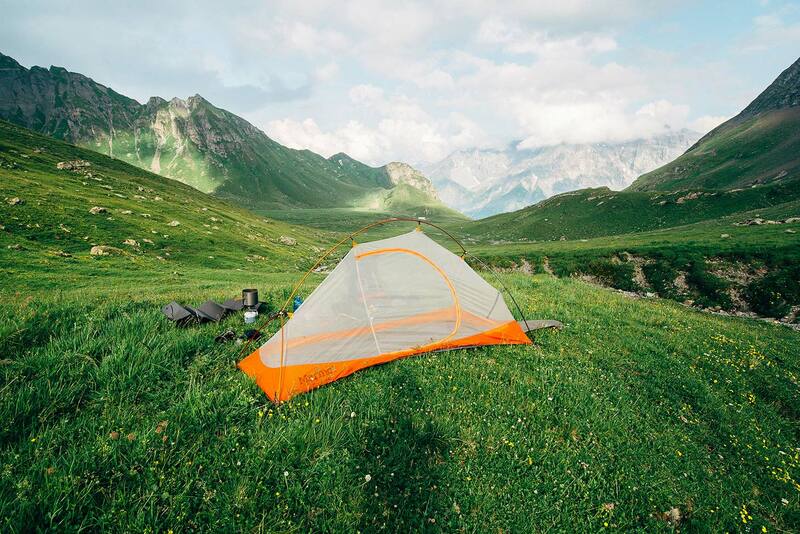 They had looked at us a bit quizzically, most likely because backcountry camping as we know it in the U.S. is not common at all in Switzerland due to the country’s excellent network of alpine huts. After hastily pitching our tents, I headed back up alone to find a vantage point for the sunset. It was amazing that I could climb in 15 minutes what it took me to climb down in 45 with my heavy pack on. I reached the top just as the sky and the sun began their lightshow. It was the most magnificent sight I have ever seen in my life. The sun hit the valley floor in patches, the valley looking like a bowl carved into the side of a mountain by some mad giant. I don’t remember how long I sat up there, just thinking and soaking in the views, the happiest I’ve ever been in my life. The outdoors had been an escape for me – a way to reinvent myself. Growing up, I had never been sporty or athletic. 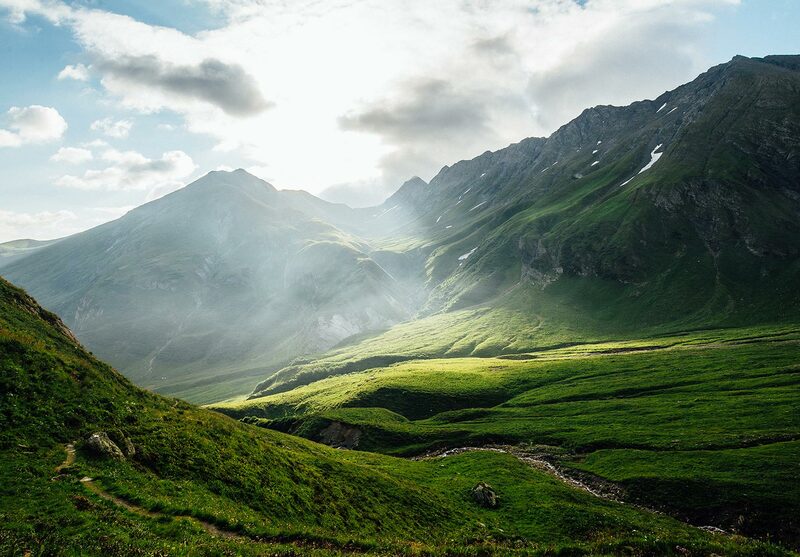 In New York, we had beaches and sand dunes and great flat expanses of city blocks and suburbs both, but the mountains were this mythical place I saw on TV shows and postcards – a land of fairy tales that I would never experience first-hand. These days, I find myself in the best shape of my life, running almost daily and hiking when I can. Mountain culture is one of the most welcoming communities. From climbers to hikers and backpackers, I’ve found fellow outdoorsmen and women to be some of the nicest and open people, embracing newcomers as old friends and always encouraging the next adventure. 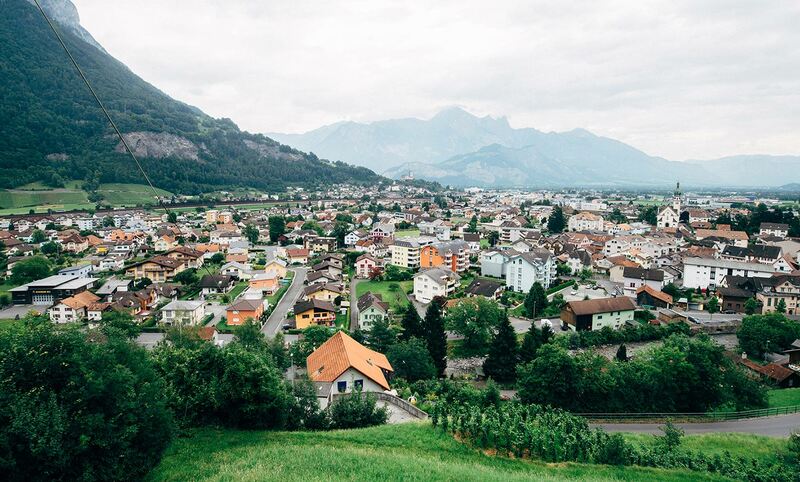 The same can be said of the alpine communities in the Swiss Alps. Everywhere we went, we were greeted with kindness and hospitality and gained some great insight into the local culture. Perhaps it’s the fresh mountain air – I’m not sure – but everyone is nicer in the mountains. It was getting dark now so I headed back down to my tent. The next day, we would head over Richetli Pass and down to the town of Linthal. We said our goodbyes to the greatest campsite in eastern Switzerland and set off on another long, hot day. In the next, we would head over the famous Klausen Pass and into the Uri Alps over Surenen Pass. Neel left after the first week and I continued the journey solo. Unfortunately, I skipped over about 40 miles of the trail in Central Switzerland due to the heat wave. I’d like to go back one day soon and hike the entirety of the trail, but when all was said and done, I managed 190 miles of it, which was impressive for me in its own right. 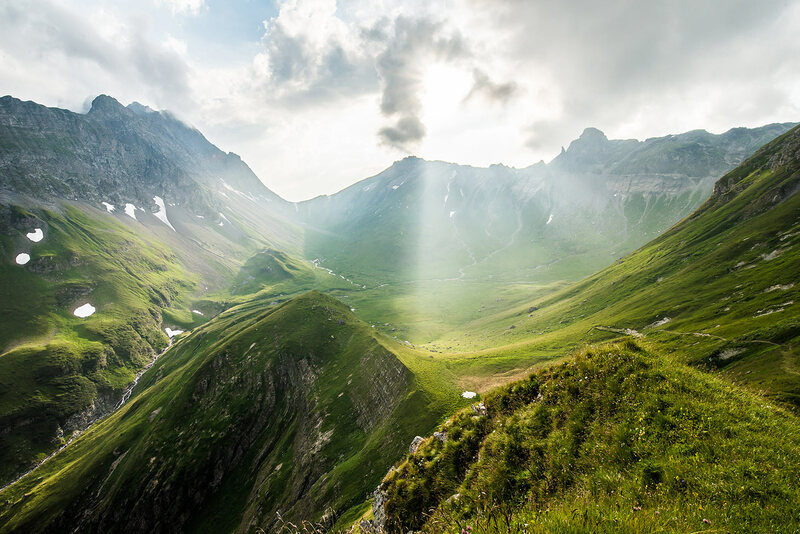 The high alpine passes of the Berner Oberland are stunning in their magnificence. The sequence of Sefinenfurgge Pass, Hohtürli, and the Bunderchrinde is, in my opinion, the holy trinity of the APR. From the glaciers sprinkled over nearly every inch of Blümlisalp to the glacially-carved Gasterntal Valley reminiscent of America’s own Yosemite, the three days over this segment are unforgettable. It was just past noon on a partly cloudy day below Bunderchrinde Pass when I stopped at a small Alp. 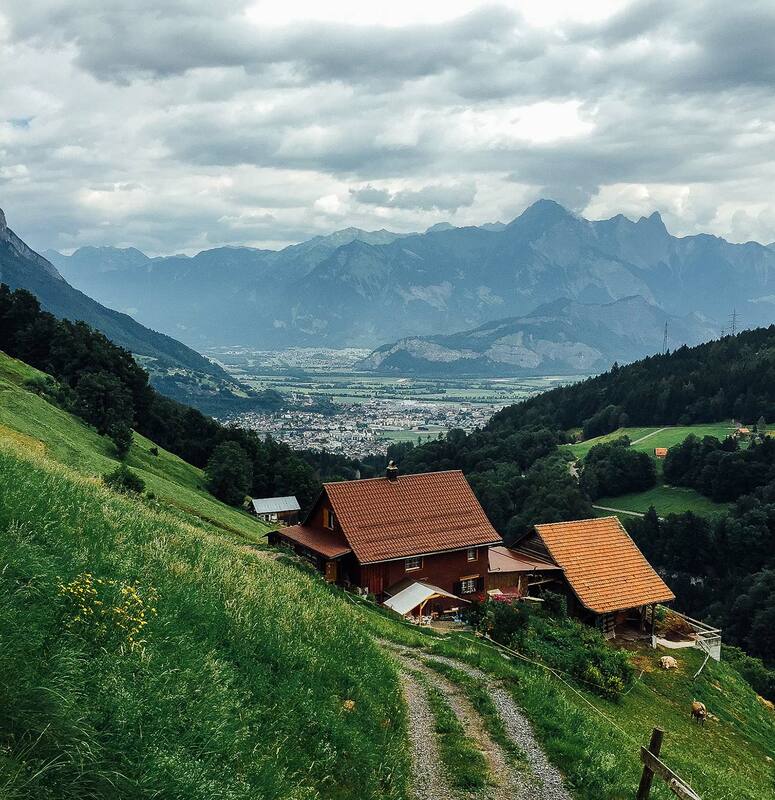 “Grüezi!” I called out tentatively into the empty-looking refreshment shack,grüezi being the Swiss-German word for “hello.” I purchased an Apfelschorle – a carbonated apple juice that I’d come to love when I was living in Germany – and lingered for a few minutes. In my broken German (Swiss people speak a divergent dialect of German called Swiss German, but they can communicate in the high German spoken in Germany as well), I explained to him that I was thru-hiking the APR. He chuckled good-naturedly and wished me the best of luck. It’s times like these though that I wish I could speak German more fluently. There were so many questions I wanted to ask him: what did he do for a living? Did he live here in the town of Kandersteg all his life? What did he do in the winters when the alpine pastures are covered by deep snow? In the end, I only managed to ask him a fraction of a fraction of those questions. I hurried on my way, nearly to the top of Bunderchrinde Pass at that point, when I realized that I never even asked him his name. They say that if you don’t like the weather in the mountains, just wait five minutes and it will surely change. As I reached the top of Bunderchrinde, droplets of rain began to fall. Looking back in the direction I came from, I had a fantastic view for miles. Looking in the direction I was heading in, all I saw was a thick layer of clouds and fog. A rumble of thunder sounded in the distance, and I knew that was my cue to start the 4,000-foot descent. I was perched between two small granite spires, which didn’t bode well at all. Hurrying down the switchbacks, I finally descended below the clouds. 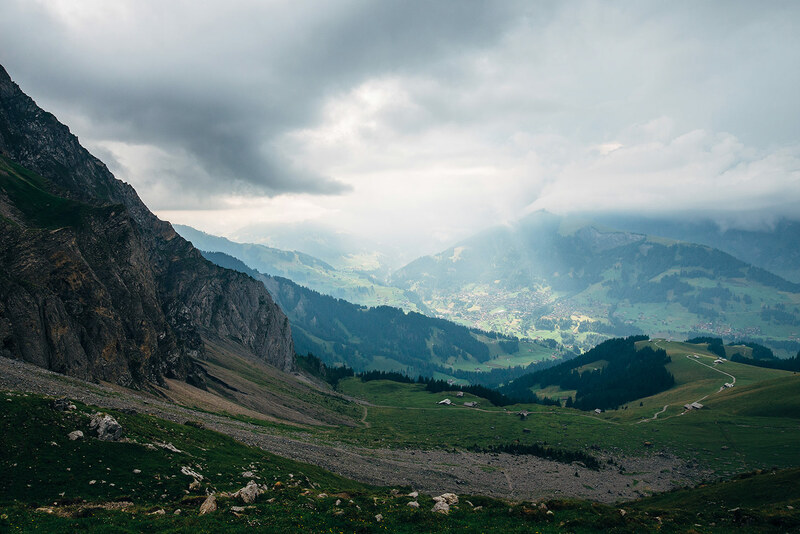 My destination for the day, the town of Adelboden, was visible in the far distance, rays of sun shining on it in the midst of violent, dark gray clouds. But this was the calm before the storm, and with about three miles to go, the skies opened up and the downpour began in earnest. Storms like this one are quite common in mountainous terrain. Vicious thunderstorms that descend in the blink of an eye and are over even quicker. I took shelter on the porch of a farm building not far from the forest’s edge. The sound of the thunder was deafening. Not even a second separated light from sound. With nothing else to do, I got my camera out, although I’m not entirely sure what I was hoping to get a picture of. 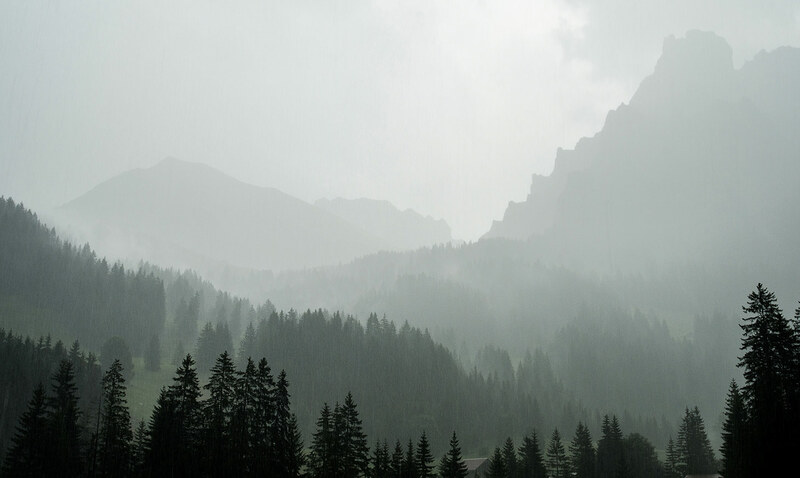 The heavy rain was like a fog, obscuring the mountains behind it. Eventually, the downpour eased into a steady rain and I continued on my way. Even though the rain continued through the night, there was, I had hoped, a silver lining – the end of the heat wave. 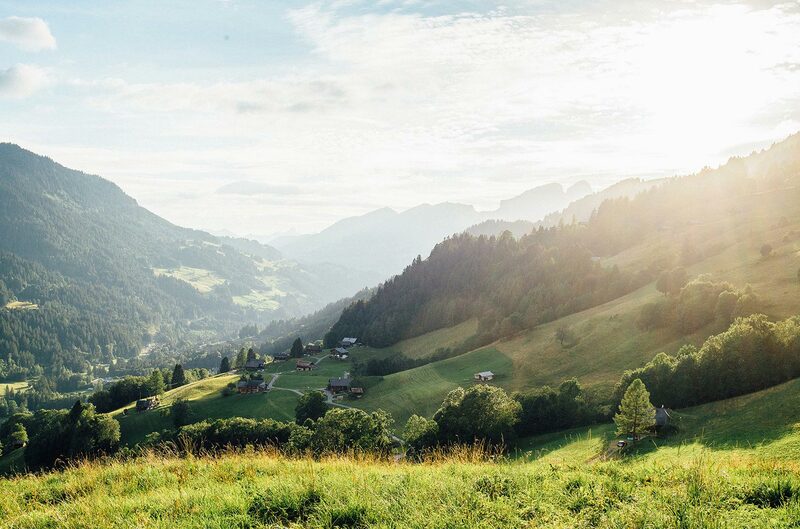 Adelboden is a large town in the Berner Oberland that receives its fair share of tourists in the summer. This was the most people I’d seen on the entire hike so far. I was dead tired and sopping wet from the rain though, and passed out almost as soon as I found a hotel with vacancies. As it turned out, the heat wave did break and the weather was fantastic for the next three days. My final day heading down to Montreux was a wet one though. I walked about 18 miles and descended almost 7,000 ft in the rain that day. My body had never ached so much in my life, but as I reached the city the sun made its presence known. I trudged my way to the train station, acutely aware that I must have stank to high heavens, both from the sweat of the last couple of days and from the rainwater in my shoes and socks. 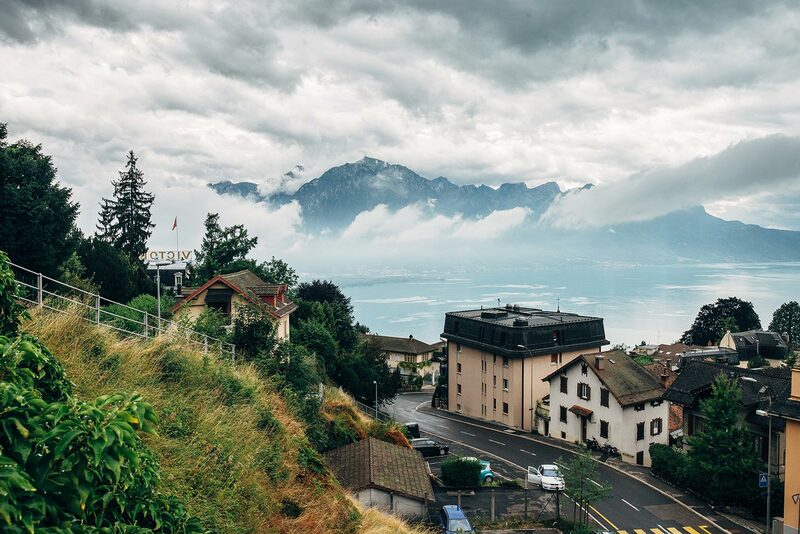 The pace of life in Montreux, a large city in the Swiss Romandie (the French-speaking part of the country), is, as in any other city, less personal, quicker. A world with its own set of rules wholly different from the world I just came from, only a few miles away by foot but seemingly light years away on the cultural spectrum. As a New Yorker, none of this was shocking to me. But the cultural whiplash one experiences when moving between these worlds is considerable. I’m still processing my experience on the Alpine Pass Route half a year later. It was the experience of a lifetime – one that, given its enormous physical fitness requirements, is not undertaken by the typical tourist. I was offered a glimpse into the unique culture and traditions of this corner of the world, and can only recommend that anyone with a love for the outdoors do their best to make it out here at some point in life.